Sold and set to be restored. I'm in love with Capitol Hill and glad to see some of our local developers starting to get involved down there. Agreed! IMO, Capitol Hill has the best bones of all of our districts because it wasn't totally wiped out by demolition. I'm so excited to see the area get its turn. The problem in that immediate area is the housing stock is almost all small homes, most of which are pretty run-down. It's not like other historic areas where there were cool adjoining neighborhoods. Therefore, it's going to be a big challenge to raise that area up beyond a certain point. It's too bad because the area between Mount St. Mary's and the commercial district is super cool but there is little decent housing. 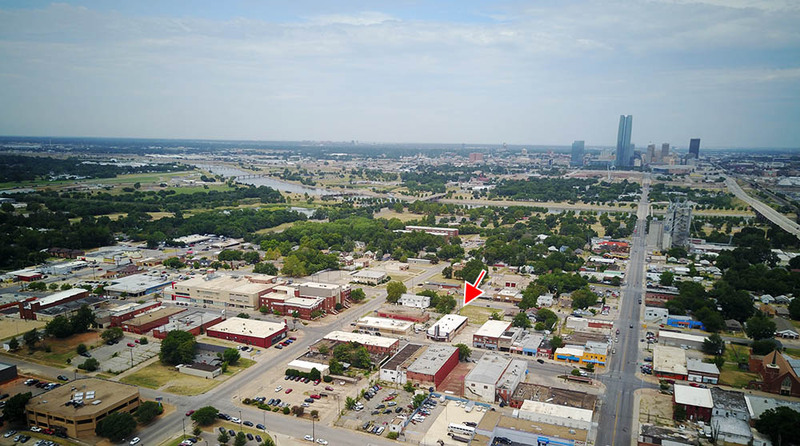 It's awesome to watch how things are condensing in OKC as developers continue to take chances in reviving old spaces and creating new ones where there was nothing before. And the vast bulk of this being within and around the vicinity of the CBD and Midtown is clearly helping densify OKC. Of course there have been some exceptions, but I think OKC is setting up for a nice and steady long term phase of robust growth for its people. It'll catch on soon enough. Though separated from the main part of 25th, the Wheeler District will probably help improve this area as it develops. Good point. That would be great to see as well. 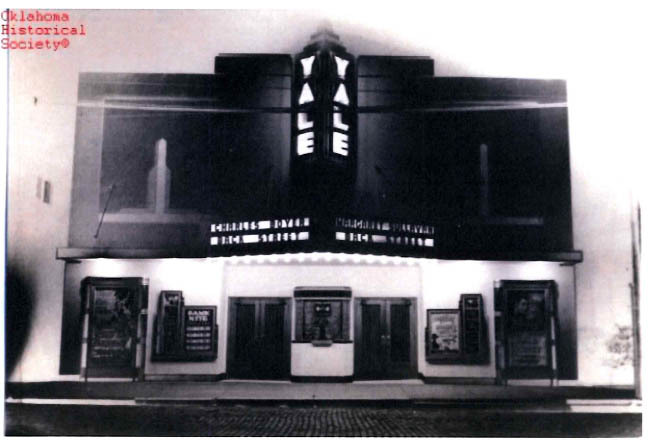 A design application has been submitted to renovate the historic Yale Theater in the heart of Capitol Hill at 227 SW 25th. 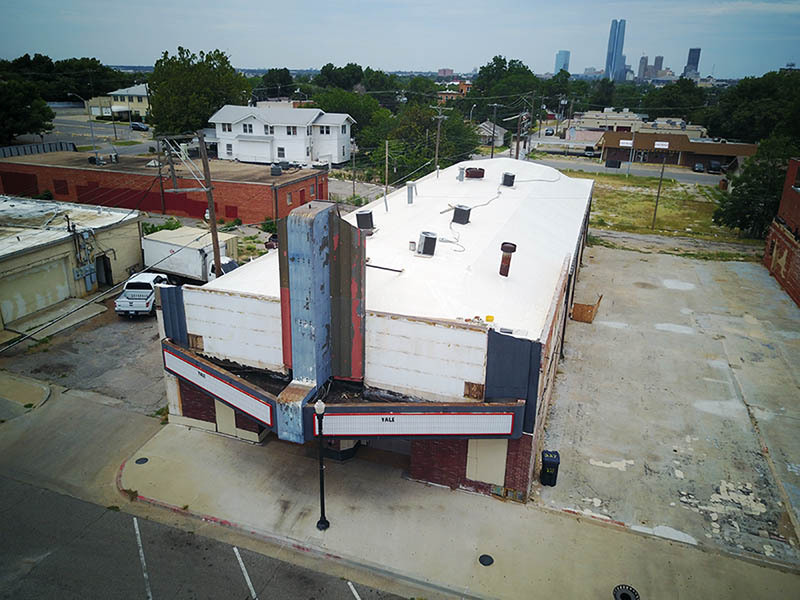 Developer Steve Mason purchase the property in December of 2016 and in an interview with the Oklahoman, shared his plans to revive the property as a wedding and events center. Built in 1918 with several additions along the way, the nearly 7,000 square foot building had fallen into disrepair and has been vacant for some time. 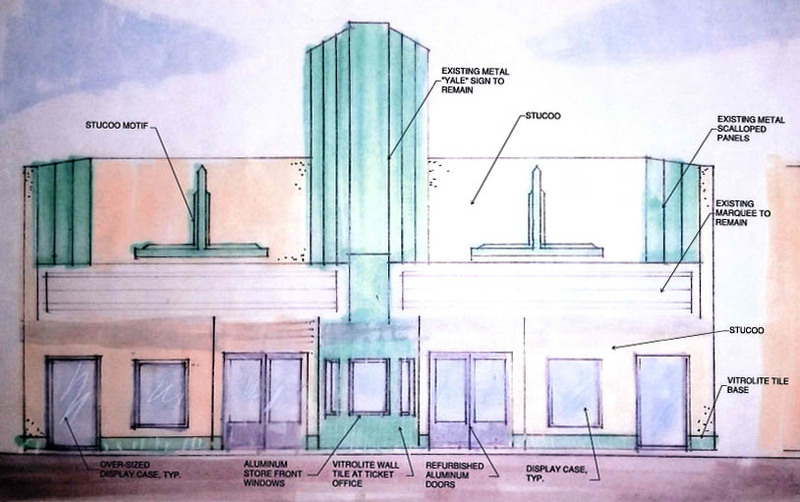 Plans drawn by Prime Architects show the entire first floor being remodeled and retaining the stage while adding new restrooms, a kitchen, two bars and raised seating areas on either side of the main floor. The second level also has a bar and bar area along with private dining and new restrooms. Outside, the existing facade will be restored with beige stucco and the existing metal marquee will be painted white and backlit. The existing metal vertical theater sign and scalloped end caps will be repainted min green. 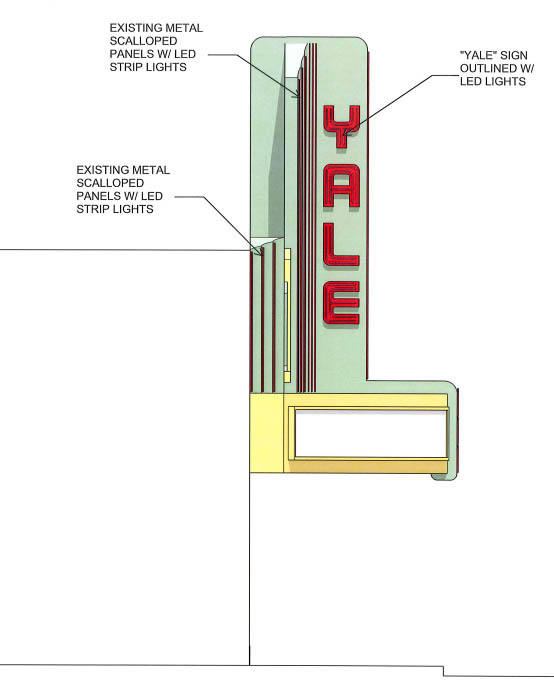 Both sides of the sign will feature the “YALE” name prominently in metail and neon and in close approximation to historic photos. 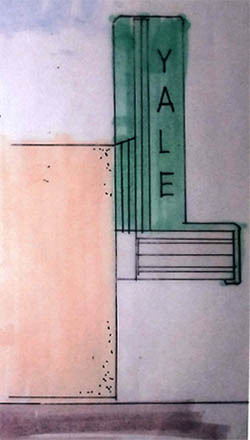 The existing ticket window will be face in mint green Vitrolite with the same material forming a base to the entire facade. Vitrolite is a type of structural pigmented glass primarily used in the first half of the 20th century. 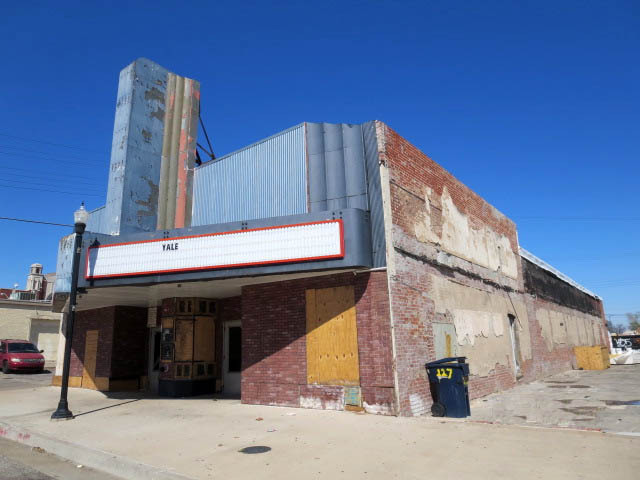 The same material was used in restoration of the Tower Theater in Uptown. 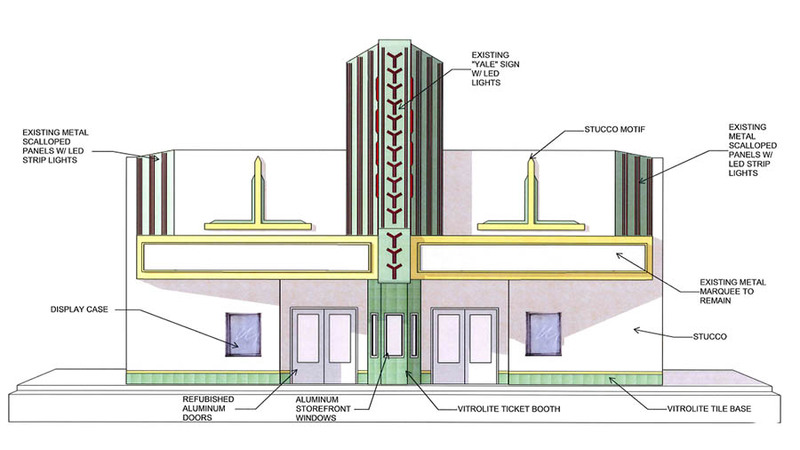 The existing aluminum entry doors will be restored and decorative movie poster style display cases will be added in locations similar to old photos. 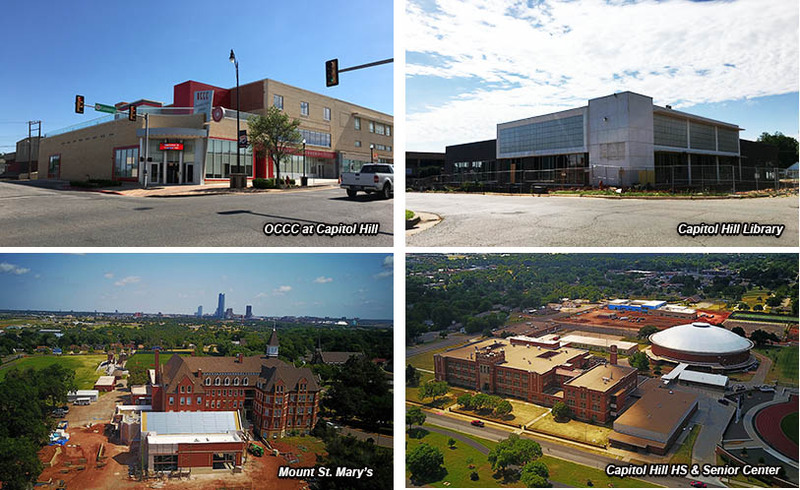 The Yale Theater renovation project joins with other large investments in the immediate area including OCCC, Capitol Hill Library, expansion at Mt. Saint Mary's school and the new senior center just to the south of Capital Hill High School. This seems like a good project! I like the bars and restaurant space in all, but it sure would be cool to see one of these spaces turned into a boutique movie theatre. +100 With them keeping the stage area, a large projection screen would be cool for "dinner and a movie" type events. the biggest problem i see with this development is its use. a wedding/event center is sparsely used through out the year. mostly you are limited to weekends during the warm season. weekdays and cold season you hardly get any business or client traffic. for the area it is better if a different use were instated, something that generates demand and therefore funnels potential customer traffic to the surrounding areas. if there were people working it it something may come out of it soon. the biggest problem i see with this development is its use. a wedding/event center is sparsely used through out the year. mostly you are limited to weekends during the warm season. weekdays and cold season you hardly get any business or client traffic. You have to consider the customer base being targeted. In Edmond, event centers may not see much use outside of wedding season. However, there is probably a greater demand for them in South OKC, particularly for hosting Quinceanera celebrations. Check out the event centers and private rooms in the Asian District. Tons of birthdays and anniversaries... Lots of huge families of many generations. Awesome to this get renovated and fixed up. A few of us Trailheaders walked through Capitol Hill last weekend and this area is just utterly BEAUTIFUL. It's one of the best preserved areas in the city. Its like the Plaza but about 3 or 4 times the size, and honestly it felt like there were actually very FEW buildings not in use. It may not have the general activities of other districts, but this area certainly is not abandoned or in dire straights. Really, the only notable buildings that seemed totally unused are this building, the white bank building previously mentioned (but work was definitely happening there), the Okla Opry building (they had posters for acts as recently as 2006 on the walls inside, looks like it hasn't been touched since), and the grocery store on the far west edge that is empty, except for its still on and functional check out counters and screens. Which reminds me, is there anything going on with the Okla Opry building? Much like the Yale here, it is gorgeous and has an awesome sign. It would make a really cool version of an Alamo Draft House type place. Anyway, if you guys haven't, go check out Capitol Hill. It's honestly my favorite area of the city. It remind me a lot of downtown Guthrie. Street level buildings for almost a mile, angled parking the entire length of that same mile. 100% walkable and safe and a wider 2 lane street for cars. The big problem with Captiol Hill is there is no good housing stock. There are no cool old neighborhoods with decent-sized houses. Everything is small -- most with single car garages. Without a housing revolution I'm not sure how far or fast this district can go. Honestly, I think it's more a matter of just catering to the existing population and a lot of run-down neighborhoods without much hope of those aspects changing. I actually would love to live down there. But I can't find a decent neighborhood to bet on. And in the meantime, everything down there is very rough. Here is a screenshot from today off Zillow showing the current housing for sale within about 2 miles of the Capitol Hill business district (outlined in red). The only listings above $100K are multi-family triplexes and the like, and not good ones. Everything else is around 1,000 SF on small lots and mostly frame, as in no or little brick. And even then, most of them are in sad, sad shape. As in not worth trying to restore. I love Capitol Hill as much as anyone but where the heck is decent housing going to take hold there? All you could really hope to do is try and assemble a block or two and then demolish everything. And that's almost impossible unless you want to wait 50 years. I may be missing a cool street or two but I've been down there a lot. This makes me think of the Will Rogers Theater on Western. They don't seem to have a problem finding enough events to host. Pete, I've always wondered why no upscale neighborhoods were developed early in that part of the city. The only thing that comes close at all are some of the homes along Grand. If I was a developer, I'd start snapping up everything between the commercial district and Wiley Post Park to the north. It's a mess with some old commercial and small, poorly maintained homes... But it's a great location with the best access to everything in that area. What's going to be bizarre, is that soon Wheeler will be taking shape. But, not a mile west of Wheeler, we have Rotary Park and all of the Section 8 housing there. Sort of two opposite ends of the spectrum, and all within walking distance of Capitol Hill. By no means is this me saying "MOVE THAT DAMN SECTION 8 WILL RODGERS HOUSING", I'm just interested to see how that entire square mile takes shape over the next decade. I wouldn't be surprised if developers start buying up that area and repurposing many of the commercial properties, and if possible combining the small housing lots to build newer houses. I like old houses as much as anyone, but small houses aren't as appealing as houses in areas like Paseo. One option would be to build new old style houses like in Paseo. i think you are righ, in part, but the bigger reason capitol hill doesn't explode in its full potential is because it lacks real leadership. the capitol hill organization that manages the business improvement district and promotes it is a real flop. i have a feeling the people there, like the director, are just happy to have a job and not doing any real, tangible efforts to get the ball rolling there. i know these things take time, usually decades, but from what i understand the capitol hill organization has been around for several years, at least ten years. bricktown, automobile alley, etc. but not capitol hill. with anybody, if you go to any of their events you don't really know what is happening, it is just a bunch of random acts and poorly managed, executed displays. and potential and become an urban oklahoma success story. 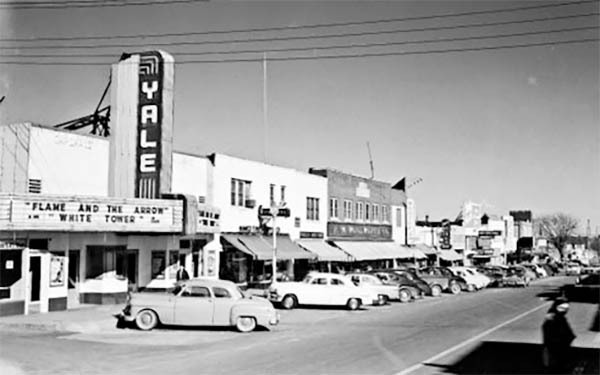 i've heard rumors that steve mason of mason realty developments has a few more development projects in the works that would come to complement the yale theater in capitol hill. from what i understand a new, themed bar, restaurant and night club like "la brasa" are coming up soon following the grand opening of the yale events center.